A variable star is, quite simply, a star that changes brightness. A star is considered variable if its apparent magnitude (brightness) is altered in any way from our perspective on Earth. These changes can occur over years or just fractions of a second, and can range from one-thousandth of a magnitude to 20 magnitudes. More than 100,000 variable stars are known and have been catalogued, and thousands more are suspected variables. Our own sun is a variable star; its energy output varies by approximately 0.1 percent, or one-thousandth of its magnitude, over an 11-year solar cycle. The first modern identified variable star was Omicron Ceti, later renamed Mira. It had been described as a nova in 1596 by David Fabricius. In 1638, Johannes Holwards observed Omicron Cetipulsating in a regular 11-month cycle. This was an important discovery, as it helped verify that the stars were not eternal and invariable as ancient philosophers such as Aristotle had believed. The discovery of variable stars, along with reports of supernovae, paved the way for development of the science of astronomy. In 1669, a second variable star was identified by Geminiano Monanari. It was an eclipsing variable called Algol, although its variability was not explained until more than a hundred years later by John Goodricke in 1784. The third variable star, Chi Cygni, was observed in 1686 and in 1704. Over the next 80 years seven more variable stars were identified. Since 1850 numerous variable stars have been observed, a process aided by the development of photography. As of 2008, more than 46,000 variable stars in the Milky Way Galaxy were listed in the General Catalogue of Variable Stars. There are a number of reasons for variability. These include changes in star luminosity or in star mass, and obstructions in the amount of light that reaches Earth. Pulsating variables swell and shrink. Eclipsing binaries get dimmer when a companion star moves in front, then brighten as the occulting star moves away. Some of the identified variable stars are actually two very close stars that exchange mass when one takes atmosphere from the other. There are two different categories of variable stars. Intrinsic variables are stars whose luminosity physically changes due to pulsations, eruptions or through swelling and shrinking. Extrinsic variables are stars that change in brightness because of being eclipsed by stellar rotation or by another star or planet. Cepheid Variables are very luminous stars, 500 to 300,000 times greater than the sun, with short periods of change that range from 1 to 100 days. They are pulsating variables that expand and shrink dramatically within a short period of time, following a specific pattern. Astronomers can make distance measurements to a Cepheid by measuring the variability of its luminosity, which makes them very valuable to the science. Other pulsating variables include RR Lyrae stars, which are short period, older stars that are not as large as Cepheids; and RV Tauri stars, supergiants with greater light variations. Long-period pulsating variables include the Mira class, which are cool red supergiants with large pulsations; and Semiregular, which are red giants or supergiants with longer periods that can range from 30 to 1000 days. One of the best-known Semiregular Variables is Betelgeuse. Irregular pulsating variables have also been identified. These are usually red supergiants, but very little study has been done on them. When it comes to changing astronomers’ perception of the universe, the Cepheid variable V1 played one of the pivotal roles. The important variable star allowed American astronomer Edwin Hubble to determine that the filmy nebula in which it lay was, in fact, another galaxy entirely, demonstrating that the Milky Way did not contain the entire universe. Cataclysmic Variables (also called Explosive Variables) brighten because of sharp or violent outbursts caused by thermonuclear processes either on the surface or deep inside. These include binary type stars, with two close stars having a mutual effect on mass. Supernovae, Novae, Recurrent Novae and Dwarf Novae are a group of stars that have dramatic or sudden magnitude increases, usually because of a stellar explosion. Supernovae are the most dramatic, at times emitting as much energy as a whole galaxy. They can increase more than 20 magnitudes, becoming approximately one hundred million times brighter. Supernovae usually represent the death of a massive star, although the core can remain as a neutron star or remnants can form nebulae. Novae and Recurrent Novae are close binary systems that are variable due to explosions on the surface, but the star is not destroyed. Nova Scorpii, which obtained peak brightness in 2007, is the brightest seen in recent years; Nova Cygni is the brightest seen in the last 70 years. The brightest measured nova since 1901 was Nova Aquilae, which in 1918 shone almost as brightly as Sirius, the brightest star in the sky. Dwarf Novae are double white stars that transfer mass and cause outbursts of regular variations. Another form of explosive variable are Symbiotic stars, close binary systems with a red giant and a hot blue star enmeshed in a cloud of dust or gas. Eruptic Variables are stars with eruptions or flaring on the surface or interaction with other interstellar matter. There are quite a number of sub-types in this category, including luminous blue variables, flare stars, supergiants, protostars, and Orion variables. Some eruptic variables are close binary systems. Eclipsing Binary Stars are stars that pass in front of each other, causing fluctuation and obscuring of the light seen on Earth. Eclipsing binary stars may have their own planets, which eclipse their light similar to a lunar eclipse on Earth. 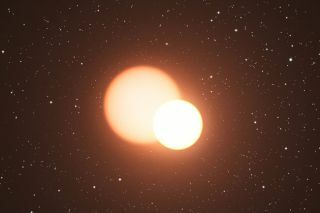 One of the best-known eclipsing binary stars is Algol. NASA’s planet-hunting spacecraft, Kepler, detected over 2,600 eclipsing binary stars during its mission. Rotating Stars are variable stars that show small light changes caused by patches of light spots on their surfaces. They may have bright spots at the magnetic poles. Rotating stars are often binary systems and can be non-spherical or ellipsoidal in shape, which causes brightness changes as they move. Pulsars are rotating neutron stars — the core of long-exploded supernovae — that emit electromagnetic radiation that is only seen when the beam is pointing at Earth. Pulsars produce precise, measurable intervals of light, and are often compared to lighthouses as they periodically sweep beams of energy while they orbit. Research on variable stars is extremely important as it gives scientists information on star properties of mass, radius, temperature and luminosity, as well as information on the structure and composition of the star and how it has evolved. Understanding the nature of variable stars requires systematic observation of behavior over many decades. Variable stars are analyzed visually and with photographic, photoelectric and calibrated charge-coupled device (CCD) techniques. Amateur astronomers play an important role in collecting data and submitting observations to the AAVSO International Database. Cataclysmic variables help in understanding active galaxies and supermassive black holes. Variable stars are a specific field of study in astronomy, providing important information on how and why things change over time. They play a significant role in our understanding of the universe.